West Sound Chorus presents a musical variety show that is part revue (songs with a scripted play for an energetic and engaging performance), and part virtuoso quartet singing that is stunning in form and presentation. The entire show is mostly A Cappella, 4-part harmony, mainly in what is called Barbershop Style. But this is not your 1950's or Jimmy Fallen Barbershop attempt. It will blow you away! This is a unique performance that is not performed anywhere else, and it is of a kind that is not otherwise available on The West Sound. It is a 2-hour (approximately) show with a 20-minute intermission. The first part of the show is a skit-based revue, featuring the chorus. The second part will feature the two sensational quartets, Signature and Renegade. It's about Time Travel, that is! How else can you visit Prehistory, The Middle Ages, and Modern Times in one evening? 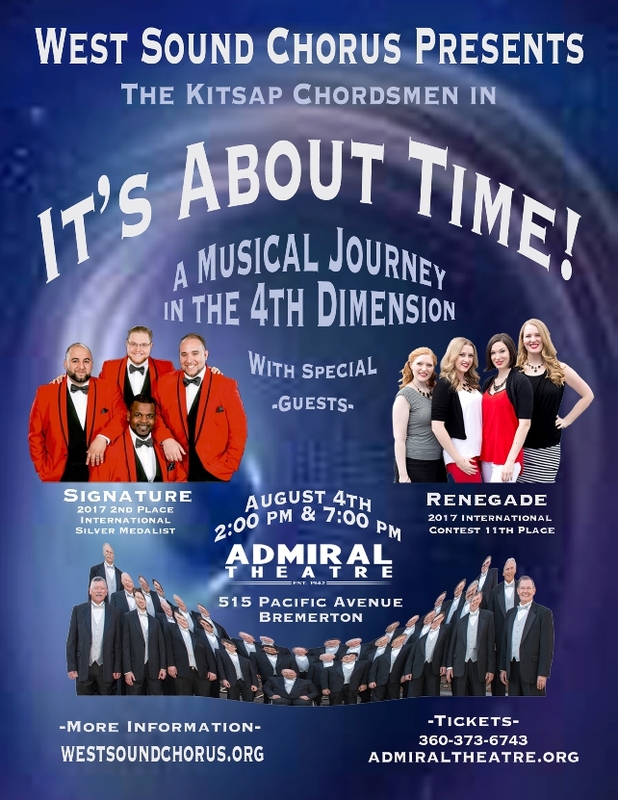 You'll laugh, and you may shed a tear, as West Sound Chorus transports you through the 4th dimension with singing, stage effects, humor and sentiment. The 25-man Chorus and cast of players will visit outrageous events in history and offer spirited and lovely songs along the way. 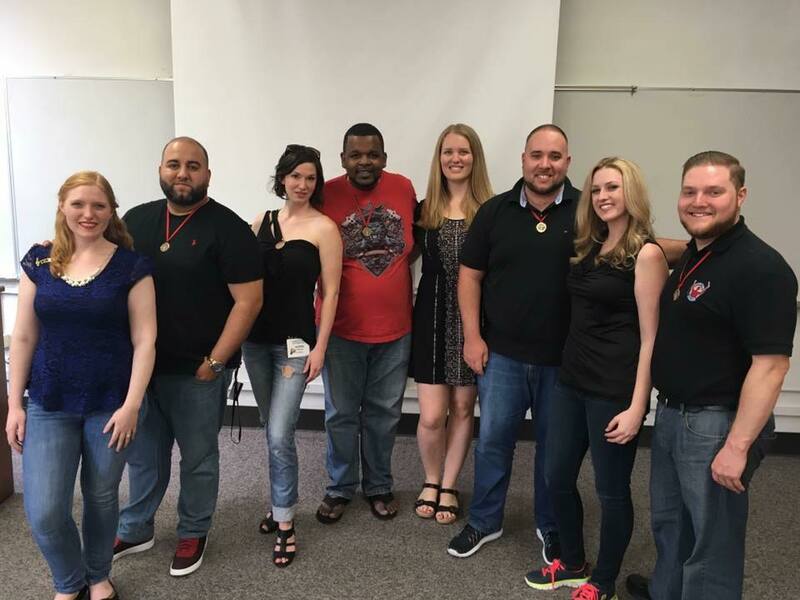 These accomplished singers bring their unique talents to meld Soul music to Barbershop Style. They also sing doo-wop and other pop music favorites. From Etta James to Queen, Signature gives lots of impassioned performances of songs you know and will love all over again. The quartet has been quickly rising through the Barbershop Harmony Society with their fresh style. Signature is the reigning 2nd place Silver Medalist at the International Contest! Coming to us from central Florida, these 30 year-old men bring raw strength to vocal harmony. We are so pleased to have them on our show after they took 11th place at Sweet Adelines International last fall. They could win this prestigious contest this year! Renegade's performance sparkles with energy and passion, and is now more spectacular! These lovely ladies' voices and stage presence captivates audiences wherever they go. Admiral Theatre is a fantastic venue. Built in 1942 in grand style, it has undergone many stages of renovation, including a million-dollar remodel last year. It is sparkling in many ways, but also it now has a new sound system. It's Art Deco styling with an under-the-sea motif brings you into a fantasy world, where we hope to draw you further in our show. Deluxe refreshments are served on both main and balcony floors. Arrive early to find your reserved seats (doors open 1 hour before the show), and enjoy your refreshments in the air-conditioned theater. Also, bring some money to buy some CD's and T-shirts. Located in downtown Bremerton at 515 Pacific Avenue, Admiral Theatre is just a few blocks from the ferry terminal to Seattle, a pleasant 1-hour ride. Admiral Theatre is, also, less than 3 miles from Hwy 3, via Kitsap Way. There is a lot of parking structures within a couple of blocks. The best parking is across Pacific Avenue at the Norm Dicks Building parking structure; it's only $2.50.